I make standard chili pretty regularly. Usually it’s beef, cut up into small pieces, pinto beans, and then all the other things to create the liquid aspect and the flavor. I like it meaty, but it can be mainly bean, get us fed cheap, and be delicious. 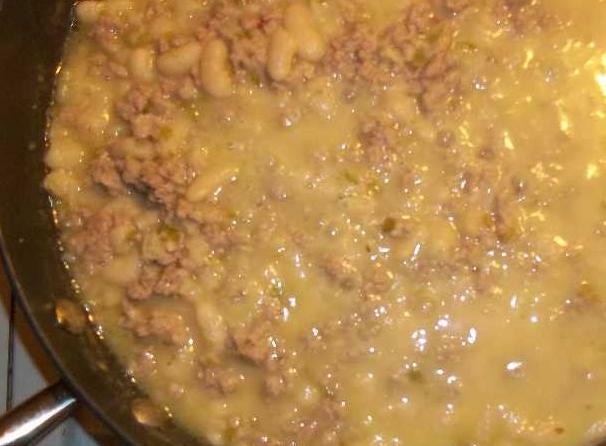 When my wife and kids were visiting her family in Oregon during the summer, her brother’s wife made a white chili with white beans, ground turkey, and anaheim peppers. Only one of the kids tried/liked it, but she loved it, despite it being pretty mild. I am used to using dried spices, except generally some fresh or frozen onion (I chop up sweet onion and freeze it in a zipper bag for use as needed), and once in a while fresh garlic. The pepper in my red chili comes from red pepper and chili powder. Using a real pepper, and one so mild, was relatively new to me. I was also sensative about “ruining” the white color of the chili by putting in a seasoning that would impart color, as chili powder does. To start, I lightly roasted two anaheim peppers over burners. Gas stove FTW! (Never used electric and plan to avoid that changing.) The Internet said put them in a paper bag for 10 minutes after that, so I did. Not sure the point, but I didn’t need them yet. When I was ready, I cut them up into tiny pieces, some of which are visible in the picture that will appear below. Those went into oil in a wok-like saute pan, along with some onion and other seasoning. I forget the details, but I may have used a bit of red pepper flakes, and definitely used oregano, a small amount of red pepper, and cumin. The trick is to season the warm oil. I may have let that sit a while, after the initial heating to par-cook the onion and pepper, for that reason. It’d be standard procedure, anyway. Then I cooked up the turkey in the pan, mixing that stuff with it, probably adding more, especially cumin. The idea was even the red pepper in small amounts would disappear into the turkey mix, and cumin wouldn’t change the color at all. I wouldn’t have added the red pepper, but I was afraid the anaheim peppers would not be strong enough, between their mildness and the larger numbers (like six) called for by recipes similar to what I was making with two. In the meantime, I had done the standard bean soaking with dried cannellini beans. That is, put them in cold water, bring to a boil, turn off, soak, rinse and repeat if desired, or soak a bit longer in cold if desired. I found they soften up faster than pintos. In fact, I loved the flavor and their creamy texture. It will not be my last time using that variety of beans, even if I don’t make white chili again. Which I will. At the appropriate time, I started them cooking at length, getting them nice and soft. A lot less time-consuming than for dried pinto beans. Anyway, cooked the beans. Cooked the meat mixture. Put the meat mixture into the beans, retaining the bean water. Seasoned some more, though not much. There may have been salt involved. Oh! Garlic. I used garlic powder and garlic salt. Forgot that in the early discussion of seasoning the turkey. Cooked it together to finish it off, since it is imperative the flavors get a chance to combine and settle. I believe I also forgot about cooking the beans in chicken broth, which for me means using bullion cubes in the water.